Energy giant Ameren Corp. and Hyperion Inc., a developing technology company in Ontario, Canada, are working with researchers at Missouri S&T to use fiber optics to monitor high-voltage power lines and equipment. The research could lead to decreased down times for consumers and cost savings for utilities. The relationship started when Hyperion was selected to take part in the 2017 Ameren Accelerator program, a partnership with the University of Missouri System, University of Missouri–St. Louis, Accelerate and Capital Innovators. The program assesses, mentors and invests in energy-technology startup companies. S&T faculty serving as subject matter experts on the Ameren Accelerator review committee learned of Hyperion’s work through the program and proposed the partnership for a new energy infrastructure technology. This year, the Ameren Accelerator is working with six new companies and have already introduced them to S&T researchers. 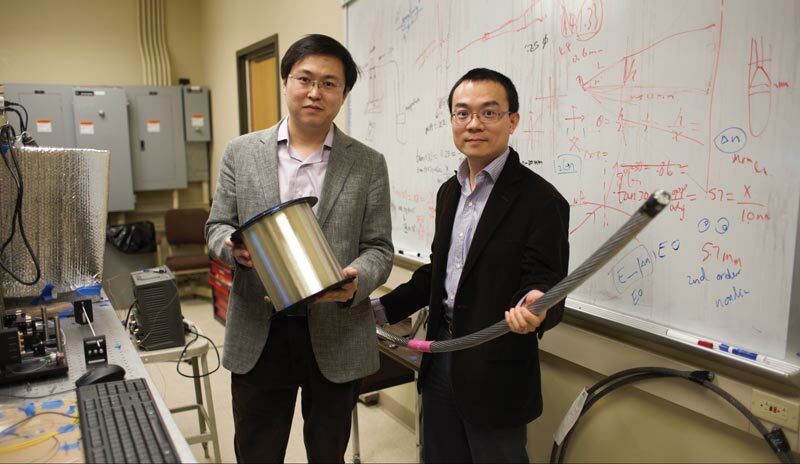 At S&T, Jie Huang (left) and Rui Bo (right), assistant professors of electrical and computer engineering, have been studying how advanced sensor technology could be used for power system applications. Their research shows how fiber optics improve the monitoring of high-voltage power lines. When combined with Hyperion’s technology solutions, fiber optics can potentially better monitor high-voltage power equipment. Hyperion’s fiber optic products monitor the different components in a substation or related power infrastructure like underground cables to monitor the health and performance of power grids. S&T researchers are using fiber optics to monitor temperature and sagging in electric power lines to better assess how well these high-voltage lines are operating. Fiber optics may be a superior way to monitor electrical systems for a number of reasons, say the S&T researchers. Large transformers produce electromagnetic waves, and the pure silica glass in fiber optics makes them immune to electromagnetic interference, says Huang. The lack of metal makes it a better approach for the power industry, and Huang says the size and shape of the fiber optic cable also allow for more sensitive temperature measurements. Better temperature readings mean a better understanding of power equipment’s performance, as well as a real-time analysis of the equipment’s operation. Providers could prevent or fix problems before major malfunctions like power loss occur. And the readings generated can help increase electricity production, reduce costs and maximize revenues for the utility operator. Huang and Bo are now attempting to reduce the cost of the system used to collect temperature information from the fiber optics. The researchers have a patent pending for the system, and Hyperion has signed an option agreement to license the intellectual property. The next steps include field-testing the technology on power lines and transformers and commercially packaging the system.